Excellent comedic writing and performances. Tickets are available at naperville. Matt Dellapina, Stacey Yen, and Susan Greenhill in Naperville. Photo by Jeremy Daniel. BOTTOM LINE: A light comedy with deeply drawn characters struggling to build something together in the burbs. Full disclosure: I happen to hail from the great Chicago suburb of Naperville -- or rather from the shadow of the epitome of that American suburban Xanadu. Therefore, mentions of local details such as Waubonsie Valley High School, local Olympian Evan Lysacek, and even the very Caribou Coffee on 95th Street where the play takes place (which recently has closed) all have a particular meaning to those of us who hail from the 630 area code. 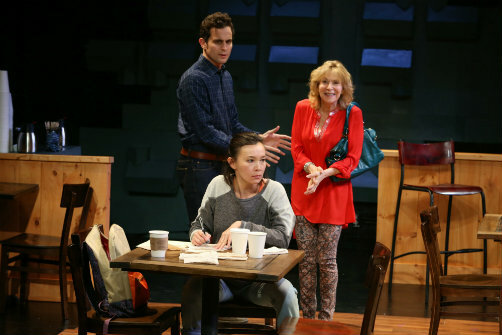 That being said, Mat Smart's clever, touching, and hilarious new play Naperville is universal whether you grew up in a subdivision, farm, or high rise (all of which actually exist in Naperville). Smart tackles the idea of mass produced society by examining the paradox of suburbs like Naperville, Illinois. They are small enough to establish a small town familiarity with people and places, but large enough to change in the blink of an eye due to consumerist demand. The play begins with Anne (Stacey Yen) dictating the history of Captain Joseph Naper, the founder of Naperville, into her smartphone. Joseph Naper was a shipbuilder -- something not many people living in Naperville shopping at the local Apple Store have experience in. Anne is enchanted by that idea of building something, "not an app or a stock portfolio -- not something on a screen or in a bank account -- but a ship." Anne's marriage has recently ended and she's clutching to the safe haven of Naperville's branch of Caribou Coffee to create a podcast (or something of the sort) on Joseph Naper and the modern day residents of Naperville. Her Waubonsie Valley High School classmate Howard (Matt Dellapina) arrives with his mother, Candice (Susan Greenhill, who gives a tremendously funny and moving performance) at the Caribou and Anne is occupying the perfect table just the right distance from the fireplace. Meredith Ries' set design is impressive in the details of the coffee shop, right down to the fake rustic lanterns hanging above each wooden bistro table. Anne obliges to move while T.C. (an endearingly neurotic Brett Epstein) relentlessly endeavors to make Candice's latte perfect on his first day as manager. Roy (Brent Langdon) is another usual suspect and an older acquaintance of Candice's. He is a dorky Christian preacher with liberal-minded views. These characters make up the community of the Naperville Caribou Coffee for one full day of business (and then some). Kristina Makowski's costumes help round out defining who each of these people are quite wonderfully. Smart does an admirable job of providing some clear stakes for each of these characters and reasons for why they all need to be in the cafe that day, and what they all need from each other. Most specifically, T.C. must have everyone out of the store by 10PM on the dot or faces losing his job on his first day as manager. The previous manager was too lenient with his allowance of customers lingering long past corporate closing hours. In spite of the projected cozy, lazy atmosphere of the shop, there are cameras in the sky watching all of T.C. 's moves. His primary form of rebellion against corporate America is playing his personal clarinet recordings just low enough in the store so that no one notices. Candice has recently lost her sight and is in need of recruits to join "Candy's Angels" to help drive her to Caribou a couple times a week. Howard is confronted with returning to his hometown after fleeing to a good job in Seattle. He is of course already completely up to date on Anne's life and divorce thanks to Facebook. Candice wants anything but to be a burden on her son and even attempts to play matchmaker by igniting conversation between Howard and Anne. The relationships grow and the legends of Naperville folklore weave their way in and out of the lives of the characters, including a hilariously sad incident of Anne in tears replaying the inspirational Even Lysacek Citi Card commercial repeatedly on the floor of the women's restroom. Under the direction of Adam Knight, the cast is adept at finding the humor and heart in Smart's well-paced script, all with a building sense of theatricality. Derek Wright's lighting walks the line between the naturalistic moments and heightened points delicately. Ethan Deppe's compositions are beautiful in how they are incorporated, especially his take on what T.C. 's clarinet arrangements might sound like. Building something together as a community is at the heart of Smart's play. Naperville is a "perfect" place where life is sort of already built for you right out of the box. Unlike living in a city, it's a suburban world where it feels more difficult to veer off of the mainstream societal track. Smart gets this exquisitely in Candice's determination in keeping her son from moving back there. Everyone forgets about their own life struggles for a moment though as a collective of citizens attempts to build something Captain Joseph Naper would be proud of. Smart doesn't always tie all of the allegories together subtly enough for smooth sailing, but I was still won over by the pure wit and heart of his characters, although he ventures into theatrical indulgence more than need be in reaching his climax of the play. The suburbs are often thought of as devoid of culture in America. Naperville illustrates that it just needs some coaxing to come alive. Smart both defends and exposes the ugliness of suburban life. The piece made me reexamine my own western suburban upbringing and what it means to go home again. However, it's also just a wonderfully optimistic view of how people are ultimately willing to help other people whether it fits into their daily schedules or not. Sometimes your barista actually wants to get your latte perfect simply because they legitimately want to you to be happy -- whether you're in Naperville or Anytown, USA.